Then they brought little children to Him, that He might touch them; but the disciples rebuked those who brought them. But when Jesus saw it, He was greatly displeased and said to them, “Let the little children come to Me, and do not forbid them; for of such is the kingdom of God. 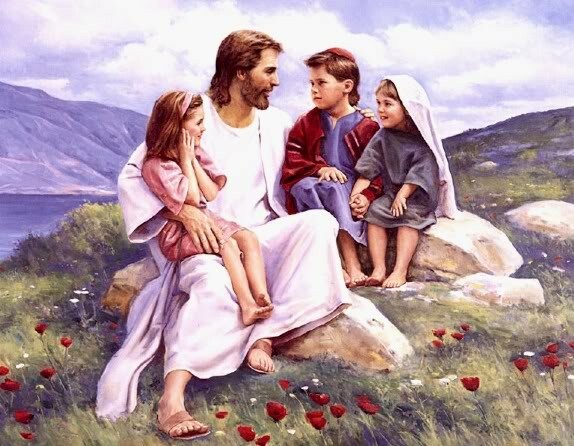 Assuredly, I say to you, whoever does not receive the kingdom of God as a little child will by no means enter it.” And He took them up in His arms, laid His hands on them, and blessed them. The encouragement for this time of devotion today is to : become like a child.” The text taken from the familiar passage in Mark 10 of Jesus cradling babies, and giving piggy back rides to the toddlers. You can almost hear the contagious laughter of children echo on the way. The verse says he was greatly displeased as his disciples rebuked the parents for bothering the Master with such a trivial thing as holding their children, touching them, and blessing them. They didn’t get it yet. It is what we all need. To snuggle on the lap of our Abba. It is what Jesus came to do, reconcile us, not to a set of traditions or rules, but to the lap of our God. A Song of Ascents; of David. Jehovah, my heart is not haughty, nor mine eyes lofty; Neither do I exercise myself in great matters, Or in things too wonderful for me. Surely I have stilled and quieted my soul; Like a weaned child with his mother, Like a weaned child is my soul within me. O Israel, hope in Jehovah From this time forth and for evermore. David sings out over the kingdom the state of his soul. The place of contentment with his status in life. His identity wasn’t wrapped up in positions, or titles, or honor. Whether Shepherd or King he had learned to quiet his soul and hope in his God. He actually uses a very strong word…weaned, to describe his inner state of being. No longer needing the breast and demanding to be fed when Elshaddi (which means many breasted one, incidentally, signifying the ability of God to provide for the needs of his people. All powerful, all providing) was near, but quiet and leaning for the simple sake of intimacy and companionship. Weaning is a messy business. The look on her face has been frozen into my memory and still brings a chuckle to my heart. Her eyes went from astonishment, to terror to anger in a fast progression. As she grasped the severity of the moment, her little lower lip was sucked under her front teeth, her eyes brimmed with tears, and she was not about to give us the satisfaction of seeing her cry! She was mad. But, that was the end of her bottle. Soon the joys of sippy cups filled with juice, and straws filled with bubbly things replaced the desire for the powdered formula she had clung so tight to, delights that she never would have experienced without the intervention. Abba knows there are times when we need intervention as well. He knows that sometimes things, people, ministries, titles, that have become toxic to our growth can be taken away from us slowly, graciously, and at other times they must be ripped from our hands and hurled out the window if we are ever to move to maturity. But, I have learned that as The Gardener did for the Honey Bee, God does for us. That night when he tucked her into bed without her beloved bottle, he gave her something more precious than a substitute for comfort, he gave her the tangible presence of his love, the safety of his arms as he read her favorite story and reminded her of what a good, big girl she really was, even if she couldn’t see it for herself yet. Whenever God withholds something from us, he always gives us himself. He never weans us without providing the place of intimacy and fellowship where we can run like David and learn to lean upon him. Finding that we long for the Giver, more than we do the gifts. As paradoxes go, this one is pretty awesome in that once we have stopped craving the childish wants, we discover a world of delight has opened for us that we can only attain, by becoming a child. Not a child of the flesh, but a child of the Spirit. Leaping into the arms of Christ with simple faith that our needs will be met, our lives attended to because he is the Good Shepherd of our souls brings with it the very keys of the Kingdom. Father, where I have grasped at power and position and fame of my own making wean me. Throw out the pacifiers of selfish satisfactions and teach me how to rest upon your breast. Give me the yearning to know your heart above all other sounds, and to sit quietly and wait for the strength that is promised to those who know how to be still.